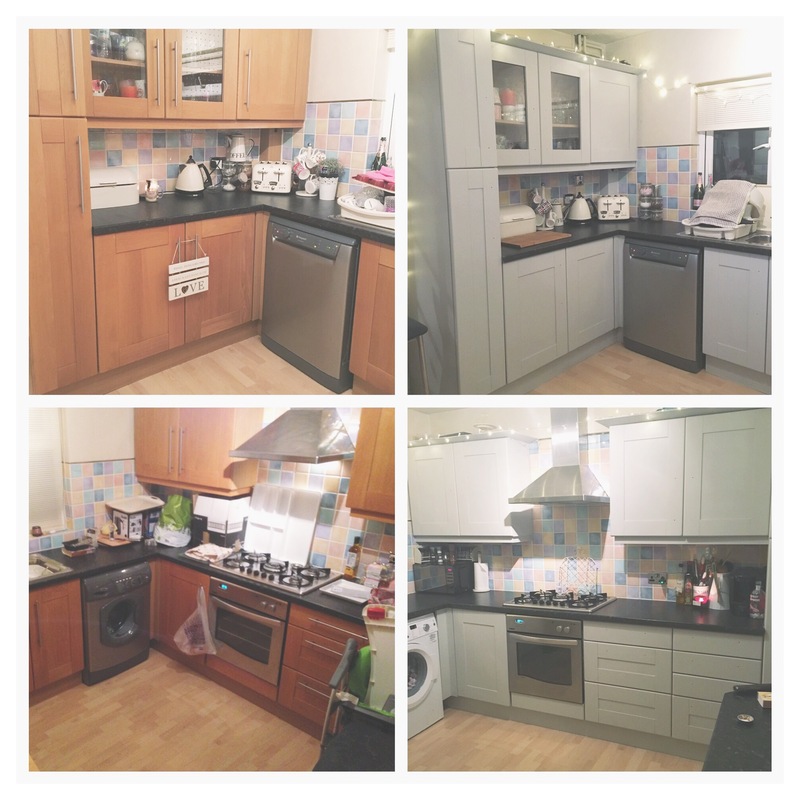 So I’ve been quite a busy bee the last couple of weekends and evenings; I’ve been trying to sort out my kitchen properly, once and for all! 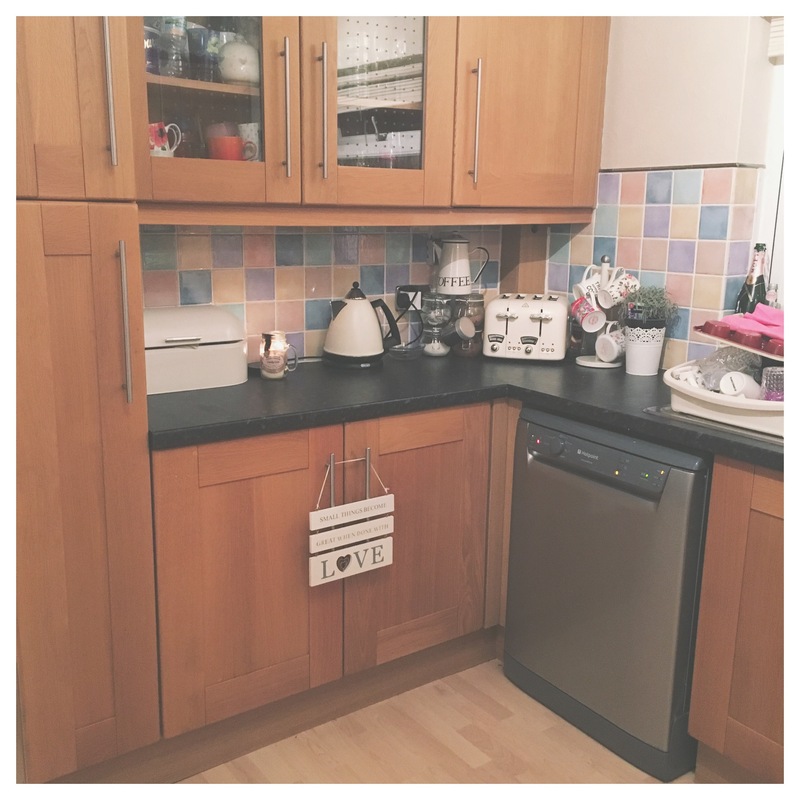 Apart from the bathroom (which I actually can’t do much to unless I have a whole new bathroom), the kitchen is the only room in my whole house that hasn’t yet been decorated since I moved in in November 2015! Anyway, I thought it was long overdue so I have made a start on *cheaply* transforming my kitchen! I know it sounds cringey, but I’ve always loved being able to have dinner around a table, talking to your family members about their day or just random things. Having breakfast, lunch and dinner around the table means that even if you can’t at any other point during the day, you know you’re going to be with your family at those times. The only downside I can say about living here is that the guy before had put a kitchen bar in which seats 2, against the wall – I suppose to try and save some space. But it also means that whenever I have friends over, we either have to stand up to eat or eat off of our laps in the lounge which I hate doing. I’ve never been able to say to my family: “Come over for dinner and I’ll cook us a roast or nice meal” because there’s just nowhere for anybody to sit and eat comfortably. So for christmas just gone, I asked everybody for money or vouchers and promised myself that I wouldn’t spend it on anything other than the kitchen or the house (I also wanted to get some artwork up). A few days after christmas I headed to Homebase and bought the Rustoleum Chalky Finish Floor Paint in Winter Grey and the Rustoleum Clear Furniture Wax. My plan was to paint my kitchen cupboards to start with. 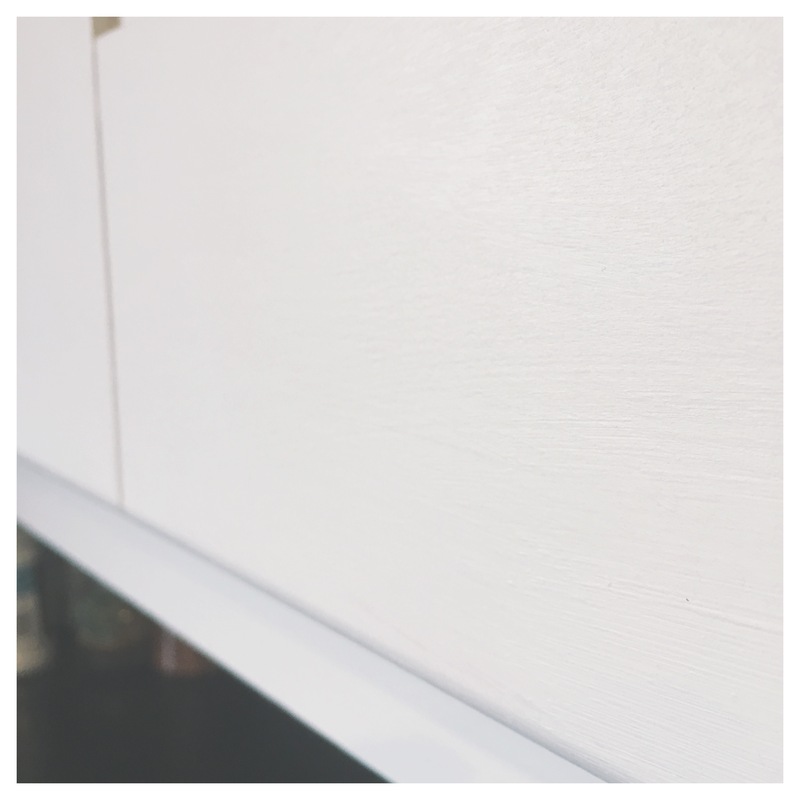 They were a darkish wood colour and although they were very nice, they just totally aren’t my style at all and I think it made my kitchen feel even smaller. 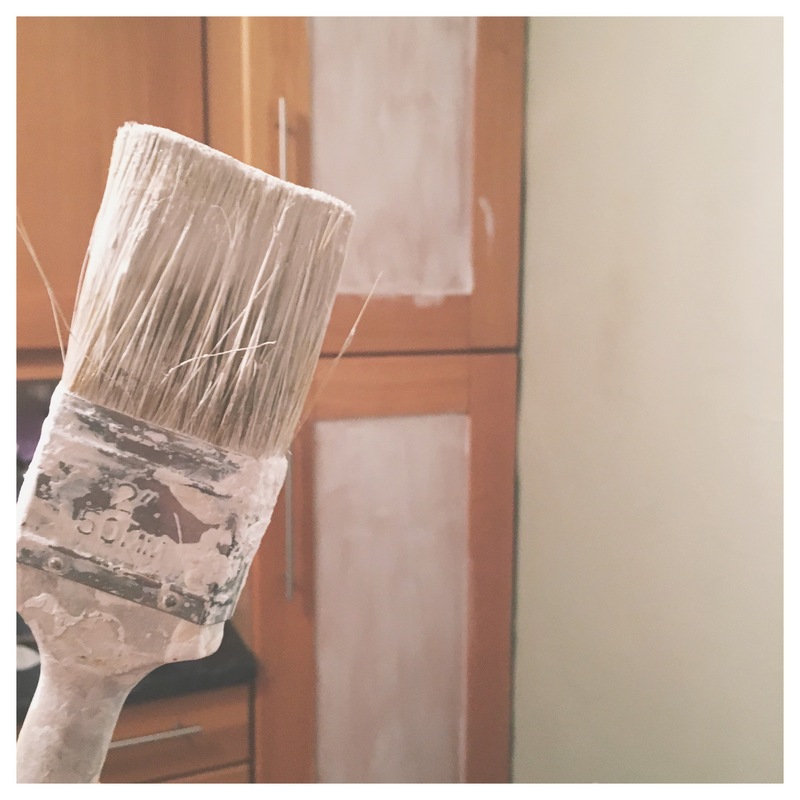 I already had a brush and a small gloss roller, but I also bought some frog tape – amazing for cutting in or making sure you don’t paint the worktops haha. (Of course if you take the whole cupboards off and paint them on the floor then you should be fine but I didn’t take them off – just the handles). 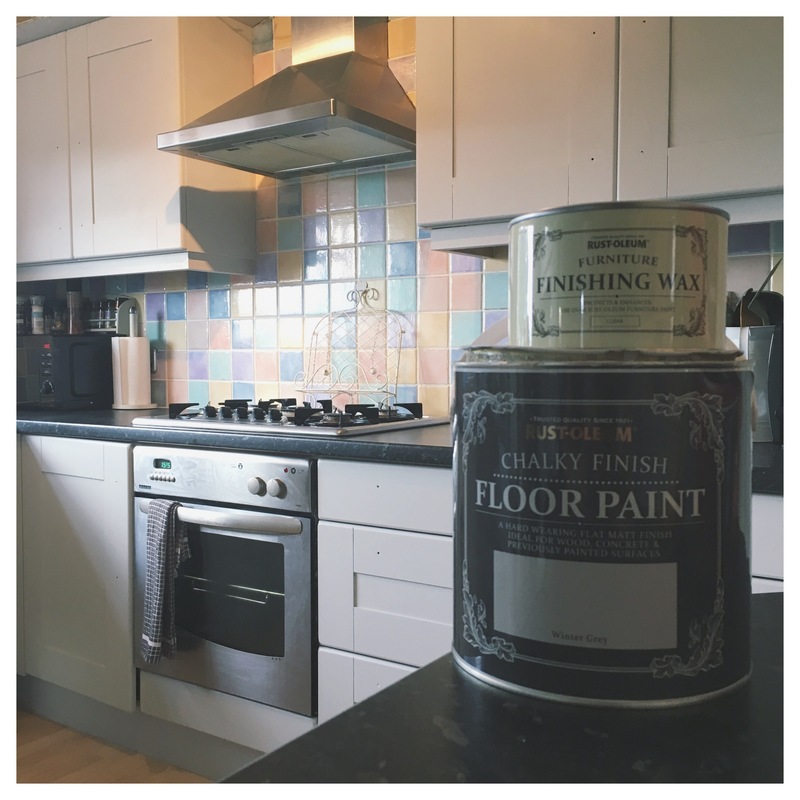 I chose the ‘floor paint’ because when you think about it – floor paint is made to be a lot more hardwearing than just furniture paint. Don’t get me wrong, the furniture paint that Rustoleum also have to offer is amazing. I’ve painted my dressing table, my TV stand, Jax’s little table and chairs, his toy kitchen, my bannister – basically anything that’s wood in my house hahah. The ‘furniture’ paint also comes in a lot more colours than the floor paint does but I was very happy with the winter grey. Anyway, I got home and I painted half a cupboard ‘just to see what it looks like’. I’m not going to lie, but at that moment I definitely thought ‘omg what the hell am I doing, this is going to take ages and now I’ve got a half painted cupboard door…’ so I actually left it for almost a month. In my head, I was telling myself that as long as they were all finished by the end of this year, I’d be happy. Then randomly one evening a couple of weeks ago I was laying on my sofa at about 8pm, exhausted and about to go to bed when I was scrolling through Instagram for the millionth time. I noticed that somebody I followed (parry.plus1 – if you don’t follow her go and follow her nowwwwwww!) had given her dining room a makeover and it just looked amazing. I messaged her straight away and I don’t know why but it just gave me some determination and I got up, put some painting clothes on and started painting my kitchen again! 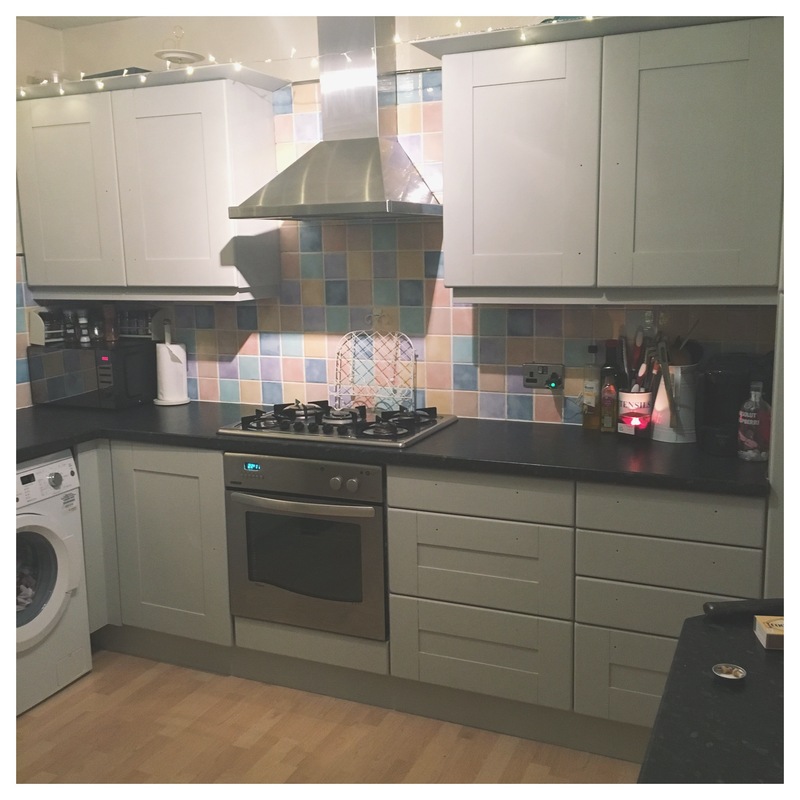 That evening I did one side of the kitchen and even just looking at it after that first coat just got me so excited to finish. It’s like it started up a fire that I want to keep burning until the kitchen looks how I want it to. 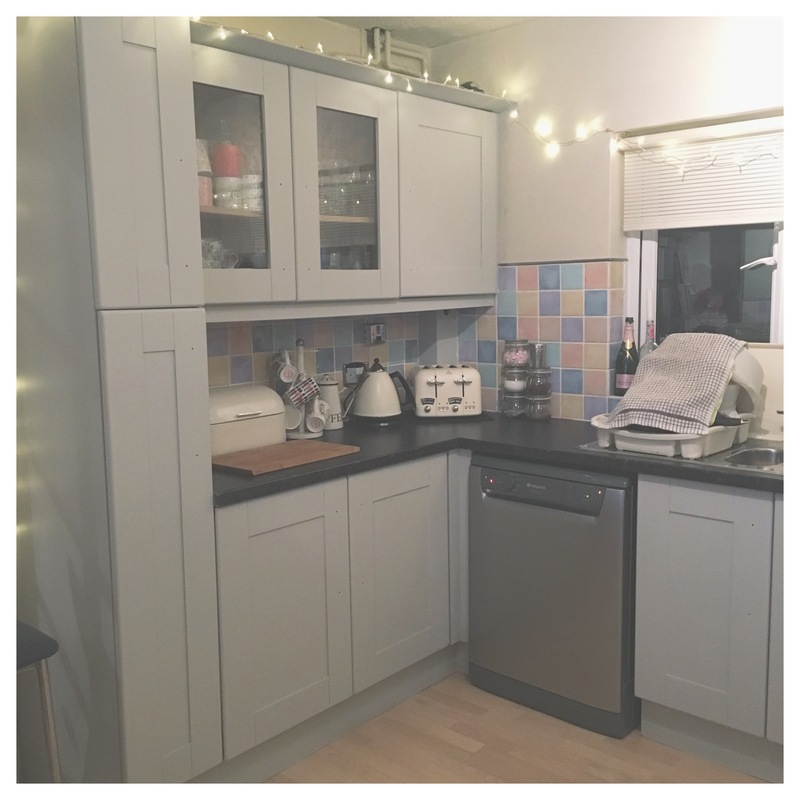 After a few more evenings once I’d put Jax to bed, and a whole sunday spent painting – I finally finished the cupboards Sunday just gone. I’m so so chuffed with how they look and I’m actually really proud that I’ve finished them. (And finished them a lot earlier than 31st December 2017 hahah). I’ve had a lot of questions about it all so I thought I’d answer them on here! Do you need to sand the cupboards down and do all of that long winded prep? Absolutely not, thats the beauty of the chalk paint. No need for that faffing about! The only thing I would suggest doing is giving your cupboards a good scrub with some degreaser spray and then dry them. I used the Cillit Bang degreaser spray. It’s a green and purple bottle and it’s brilliant. Should I take the cupboards off? I’d say that’s totally up to you – I didn’t and everything looks absolutely fine but I’d say if you’re going to completely paint inside too, then maybe its a good idea to. Definitely take the handles off whatever you choose! Where can I buy the paint from? Is it really expensive? The paint is actually in most DIY stores. I got mine from Homebase, but I know B&Q do it and also little retailers (but probably more expensive there). (Link is above in blue) For my 2.5L tub it cost me £30 for the paint and the wax was £12. I’ve got half of the tub left and that was after 3 coats of paint + the plinths and all of the edging and a little inside each cupboard. The coverage is great and a little paint goes a long way. Cheap as chips when you think about how much its going to change your kitchen. Am I going to have to wait ages for it to dry? Absolutely not, honestly it was touch dry within 30-40 minutes. On the tin it says 2 hours but I think they do that just to be sure but it dries sooo quickly! Is it going to wash off if I need to clean the cupboards? Obviously mine have only been finished since Sunday but I’ve already washed a couple because I spilt tea down it -_- and its absolutely fine. None of the paint came off at all! 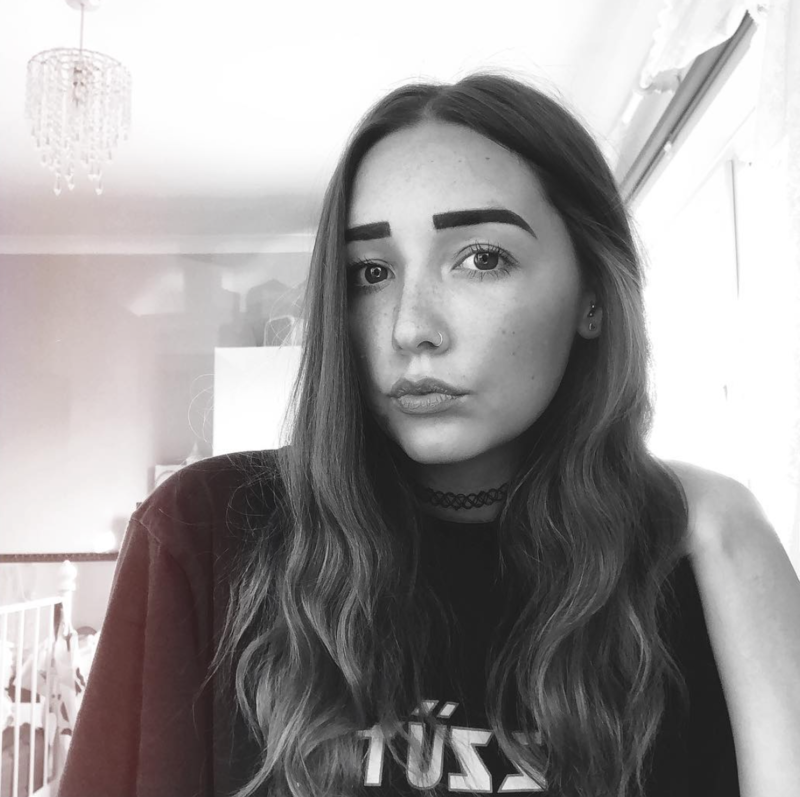 What did you use to paint it on? I actually used a paintbrush (a good quality one – nothing worse than a paintbrush where the bristles fall out!) for the first 2 coats and then used a small gloss roller (foam not emulsion) for the 3rd coat! Anyway I will keep you posted on the progress and I hope this has helped anybody who is thinking of updating their kitchen! I would honestly recommend it to anybody who is currently hating their kitchen but can’t afford a new one. I’ve wanted a new kitchen since I moved in but now I’ve painted my cupboards I’ve realised I actually don’t need a new kitchen. I know that when its finished I’m going to have what seems like a brand new kitchen for a fraction of the price, and I’m happy with that! 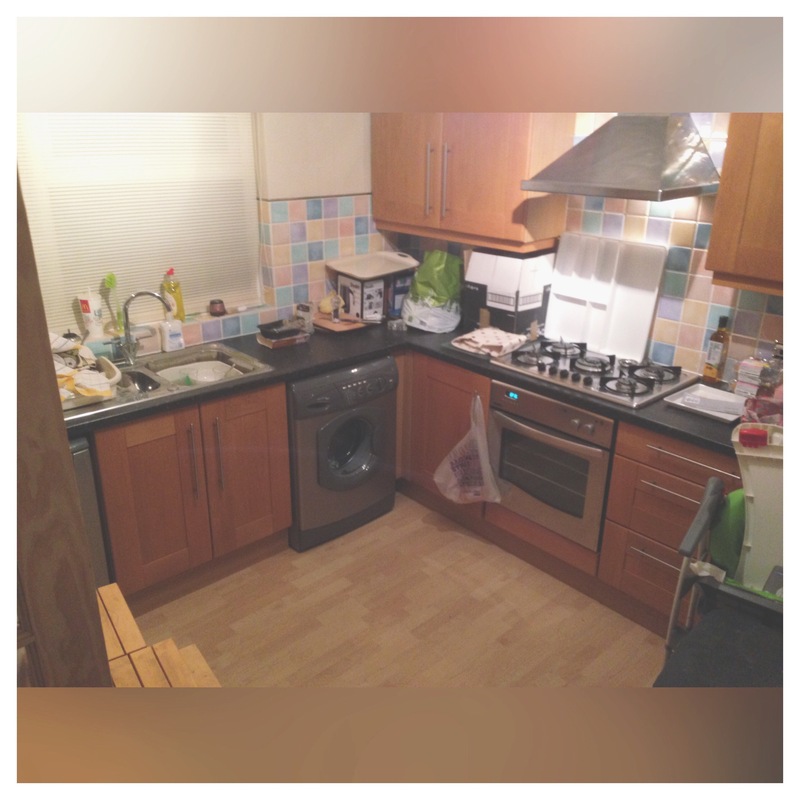 Next postMy Kitchen Transformation Take Two!